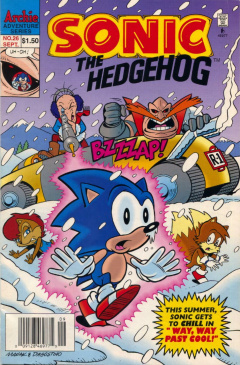 Sonic the Hedgehog 26 is the twenty-sixth issue of the Sonic the Hedgehog comic series. It was released in September 1995. This comic features two stories: Way, Way Past Cool, and Fortified. The Freedom Fighters are dealing with a hot day in Mobius. To help his friends cool down, Sonic the Hedgehog goes out onto a lake and, using his super speed, splashes water onto the others. With his speed, he's able to stay on top of the water. While scooting along, he comes upon a group of ducks, causing him to stop and drop into the lake. To further beat the heat, Tails walks over and prepares to join Sonic in the water. Despite the heat, Sally Acorn suddenly starts feeling a chill. The group look up to see a snow cloud coming out of nowhere. Sally takes out NICOLE to explain the mystery, telling them that the storm's an artificial creation. They instantly draw the conclusion that this is the work of Dr. Robotnik. Despite the blistering snow, Antoine remains optimistic, telling Sally to wait out the storm. A huge pile of snow drops on him, making him realize that this is more than a small summer shower. On a hill near Robotropolis, Robotnik and Snively are located in a large tower complex with a spherical transmitter on the top. Snively notes that the transmitter, a weather annihilator, is working successfully, with the temperature dropping below freezing. Robotnik goes on to state his plan: to drop the temperature of Mobius to a very low temperature, then to use an infrared detector to find any lifeforms, especially that of Sonic's. To continue his plan, he orders Snively to grab his sled. The Freedom Fighters, meanwhile, are trying to find their way back to Knothole Village, but the snow is making it difficult. To prevent themselves from succumbing to the cold, Sally takes out NICOLE and asks it to find a cave. It starts to read out directions, but speaks very slowly, being affected by the cold. They follow NICOLE's directions and head for a cave. Meanwhile, Robotnik and Snively, in their car-like 'sled', detect the heat signatures of the Freedom Fighters in the cave. They set a course to intercept them. In the cave, the problems for the Freedom Fighters mount as they still remain cold despite being in the cave. Sally asks Sonic to generate some heat with his super speed, but Sonic is too cold himself. When they think all hope is lost, a being comes out of the cave and tells them to follow him, if they don't want to freeze. Robotnik, Snively and a group of SWATbots enter the cave. Snively takes out his infrared detector, but can no longer detect the Freedom Fighters. An angry Robotnik orders Snively and the SWATbots to search the cave and find them. The Freedom Fighters, meanwhile, have followed the unknown creature to an area of the cave that is warm. The creature tells them that they are able to control the environment of their cave. They arrive in an area where there are many more other creatures, who introduce themselves as the Arctic Mobians. A fox introduces himself as Guntiver, a polar bear Augustus, a seal Sealia, Erma and a penguin Flip, who had led them to their cave. Guntiver introduces the history of his group, stating that they had come from the north to visit friends and relatives, only to get caught up in Robotnik's tyranny, forcing them to take cover. Sally is curious as to how they are surviving in a warm climate, while Sonic gets his gears running again. He accidentally runs into a cold area of the cave, an artificially-created arctic environment for them to live in. After he gets himself back up again, he tells the others that he wants to get back to the surface to stop Robotnik, but Sally has to remind him about the cold. This gives Guntiver an idea. He tells Sonic that he can remain and train in their arctic zone to adapt. The Freedom Fighters all agree, and plan on training together. One week later, Robotnik and Snively are standing frigidly outside their weather annihilator. Snively tries to convince Robotnik to shut down the machine, but Robotnik is insistent on finding the Freedom Fighters, even if they are frozen. Not giving up, Snively continues on, reminding Robotnik that it has been a week since they started their project, and the Freedom Fighters have not attacked the tower. This finally convinces Robotnik, so he decides to celebrate victory instead. As they go to walk into the tower, a huge snowball drops down and destroys a nearby SWATbot. From nearby, the Freedom Fighters, wearing winter gear, have set up a catapult. Tails rolls over a snowball and prepares to reload it. Robotnik enters the tower, nonetheless, and decides to set the weather annihilator to maximum to freeze them. Snively, sensing Robotnik's anger at him, decides to redeem himself by taking matters into his own hands. The assault on the tower continues, but as Robotnik worsens the weather, the clouds get lower, preventing them from targeting the weather annihilator. Near the fighters, Snively hides in snow and pops up with a freeze ray. Catching the group by surprise, he fires on all of them, freezing their lower bodies into a huge ice cube. He gloats at his success as the Freedom Fighters try to escape. He then takes the sled from earlier and pushes the group in ice to the tower. After driving a few meters, the sled suddenly stops. Snively notices he's getting no distance from his sled and looks back, seeing Augustus lifting the back of the sled. Snively turns the tide of the situation by bringing out his freeze ray, but is stopped as Guntiver jumps at him. He leaves the sled, being pursued by Guntiver, so he calls upon the SWATbots for assistance. As the SWATbots walk over some ice, Flip comes out and skates around them, causing them to become disoriented and fall. Meanwhile, Erma and Sealia attempt to separate the group with saws, but Sally insists that only Sonic be freed for now. Sonic uses this idea for a plan, telling Erma and Sealia to put him in the catapult. Augustus loads Sonic, still in ice, onto the catapult while the other Arctic Mobians watch in shock. At the top of the tower, Robotnik gloats at his creation, as Sonic is tossed right at him. He calls out to Robotnik, and hits him just as he turns around, destroying the ice. Now free, Sonic bounces off of Robotnik to the top of the weather annihilator, destroying it with a spindash. With the annihilator destroyed, the weather on Mobius returns to normal. With the day saved, the Arctic Mobians thank Sonic and the others for their help. They have taken Robotnik's sled and prepare to set off home, with new-found courage to help them. As they drive off, Sonic grabs some of the remaining snow on the ground and challenges the others to a snowball fight. Having had enough with snow, the Freedom Fighters throw snowballs at Sonic at the thought of that. While in the middle of exploring a mountain, Sonic sprangs his ankle. The Freedom Fighters have other problems as well, with Robotnik chasing after them. With Sonic being carried by Sally and Antoine, and the Rotor and Tails tired from the journey, they have no energy to keep going. The only one who isn't tired is Bunnie Rabbot, who has found a bunch of trees that are blocking their path. She moves them, but realizes they aren't trees afterall. Not far away, down the mountain, Robotnik and Snively are chasing after the Freedom Fighters in their large Botbus. The two look at a radar, and notice the Freedom Fighters straight ahead up the mountain. Robotnik laughs manically at his preeminent victory. The 'trees' were actually a wooden gate into a fortress, built by Mobian ancestors. The group look around in awe at all the preserved history, but with Robotnik coming, this fortress would be destroyed by him. Antoine locates a cannon and some cannonballs, but upon closer look, Rotor finds it to be too old to be used. Tails, however, has found something of his own. He leads the group to a blacksmith's shop, which Rotor could use. Bunnie, meanwhile, closes the main entrance to the fortress to help stop Robotnik from getting in. She then wishes she were fully a robot to help them out, which gives Sonic an idea. He asks Rotor if he still has his pocket laser, then tells him to bring the cannon to the workshop. Later on, Robotnik and his Botbus arrive at the fortress. It slams into the main entrance. Robotnik then grabs a microphone and calls for the Freedom Fighters to come out. From aside, a robotic being challenges Robotnik. It's Bunnie Rabbot, full covered in metal armor from the cannon. Robotnik accepts Bunnie's challenge and deploys a legion of SWATbots from the bus. As the legion charges at Bunnie, Bunnie charges at them herself, then using her robotic half to launch herself at the group. The force takes the SWATbots down easily, but she still has to deal with the Botbus, which prepares to run her over. She tries to run away, but can't run fast due to the armor, and she can't hop either. The bus eventually corners her in the fortress. Right before it reaches her, she uses her legs to extend herself up, causing the bus to drive between her legs and out the fortress...down a cliff. The Freedom Fighters come out from cover, congratulating Bunnie and thanking Sonic for the idea. Despite not being able to run with his ankle, he's still able to think quicker than even Robotnik. The Sonic Triple Trouble special comic is introduced in Sonic-Grams.